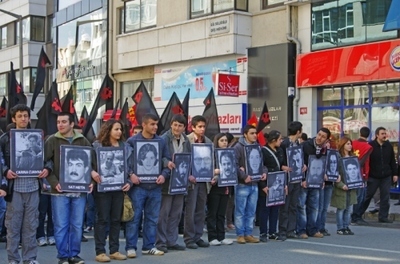 Alevi demonstrators carry portraits of 1993 martyrs, Kadiköy, Istanbul, March 31, 2012. Dressler, an assistant professor of religious studies at Bayreuth University in Germany, writes that Alevism is viewed by "most insiders and outsiders" as "part of the Islamic tradition, although located on its margins," and most often described as heterodox and syncretic reflecting the influences of Sufism as well as the Shiite sect. And yet, "it is widely taken for granted that Alevism constitutes an intrinsic part of Anatolian and Turkish culture … carry[ing] an ancient Turkish heritage … [from] the depths of [the] Central Asian Turkish past." Alevis constitute a sizable minority of Turkey's inhabitants, 10-15 percent of the national census, according to Dressler. The author contends that roughly 20-30 percent of these are Kurdish. Alevis are also present in the Turkish migrant communities in Germany and other Western European countries. Despite these numbers, Turkish authorities have tended to disregard the Alevi sect, either by ignoring it or declaring it part of the dominant, state-administered Sunni Muslim community. This approach results in anti-Alevi discrimination. Alevis complain that they and their spiritual leaders are denied government support of the kind granted to Sunnis and their clerics. Alevis also call for the removal of the state-sponsored "Religious Culture and Ethics" curricula from schools or, at least, the inclusion in them of "adequate and positive" materials on Alevism. They further seek recognition of Alevi houses of worship with standing equal to mosques, churches, and synagogues. The most tragic example of their plight was a 1993 Islamist attack on an Alevi cultural celebration in a building set afire where thirty-seven people, mainly Alevis, perished. Dressler has produced the first detailed study of Alevi history published in English. Although heavy with contemporary academic jargon, its breadth is encyclopedic. Notwithstanding its sometime convoluted form, Writing Religion is an important and necessary addition to Turkish studies.